As some may know, while in the small hours I run The Bioscope, in the daylight hours I take occasional care over Screen Research, a social network/information source on moving image research. The latter is mostly devoted to current activity in the online video world, but the photograph section concentrates on older material, simply on acount of rights issues. So this is just to let Bioscopists know that there is a growing collection of silent film images to be found there. 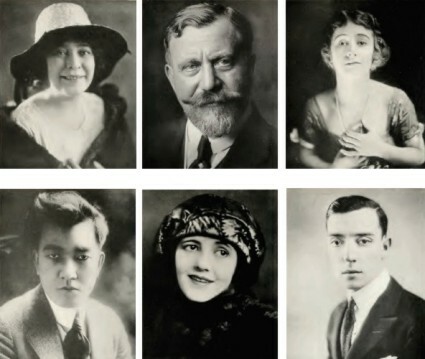 In particular, I have just finished working my way through the Internet Archive copy of Charles Donald Fox and Milton L. Silver’s Who’s Who on the Screen (1920). This is a 400-page biographical guide to Hollywood in 1920, with a photograph and mini-biograph per person per page. I have published each individual on their individual page in four ‘albums’, with actors in Part 1, Part 2, and Part 3, and directors, executives etc. in Part 4. I find the parade of images haunting (the quality of the photography is outstanding, even if the image resolution is low – the photographers are credited in an acknowledgments page on Part 4) and the biographies intriguing for the emphasis placed on how healthy every one was. All the actors stress the sports they follow and their love of the outdoors. The executives feel less need to do so. There is more silent material to be found under the Photos section. Film historian Deac Rossell has added some gems from his personal collection, including lobby cards, programmes, contemporary collectors’ scrapbooks, and some rare examples of movie star pennants from 1915. Do take a browse.